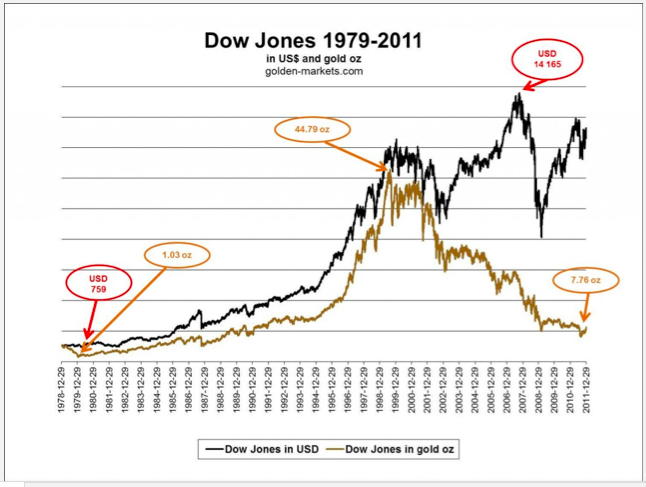 The Dow-to-Gold Ratio is one of the more commonly used ratios when relating stock market performance to gold. Most often the idea is to highlight gold as a unit-of-account, but not always. When we started out tracking the major exchanges, Dow Jones wasn’t on the list. However, due to the widespread use of the DJIA and reader feedback, we have decided to include DJIA in our weekly updates. As a start, we have put together a long-term chart in both local fiat currency (USD) and gold. These are daily numbers spanning from 1979 till the end of 2011. The lows at USD 759 and at 1.03 oz occurred in 1980, while the highs at USD 14,165 and 44.79 oz occurred in 2007 and 1999 respectively. Notably, by the end of 2011, the Dow-to-Gold ratio was at 7.76 oz. At the bottom of 2011, the Dow was at 5.85 oz. Historically, we have had bottoms of around 2 oz during the Great Depression 1932 and around 1 oz at the 1896 bottom. We had highs in 1929 at 18 oz and in 1966 at 28 oz. As we are now approaching midyear 2012, the Dow is trading at slightly below 8. Thus, there’s still a long way to go to the historical bottoms at 1 or 2 oz. Will we get there at all?